Hey guys! Today I have my review of the Dior Addict Lacquer Sticks. I ended up picking up two colors, Indie Rose and Sulfurous. My lips are naturally dry. I have to regularly exfoliate and I suspect that has something to do with my dependency on lip balm. These are moisturizing on their own without lip balm but Indie Rose is unforgiving to cracked lips; it likes to settle in those cracked lines so I'd recommend some nice exfoliation beforehand. I don't have that problem with Sulfurous though. I can just swipe on the color and go! Dior describes these as lacquer sticks, which I suppose is accurate; lip lacquers, aka gloss but in stick form. They are supposed to have high shine and intense coverage, which is also accurate. I really like these. When I purchased them I thought they would be more like the Dior Addict Lipsticks, but they are not. The Lacquer Sticks come in a luxurious black tube; when I opened the box, I gasped at the beauty of these things (I love pulling these out of my purse, makes me feel like I'm giving myself a treat). I did notice, however, that these don't have that magnetic closure that the Dior Addict lipsticks have, which is kind of disappointing. That's a feature I really appreciate, and adds to the luxury-feeling. I feel like Dior should have included that feature on these, especially since they are the same price as the Dior Addict Lipsticks. I have to be on the careful side when I apply these. I have large lips so when the color goes over my lip line, it makes my lips look even larger. The shininess of them also adds to that. 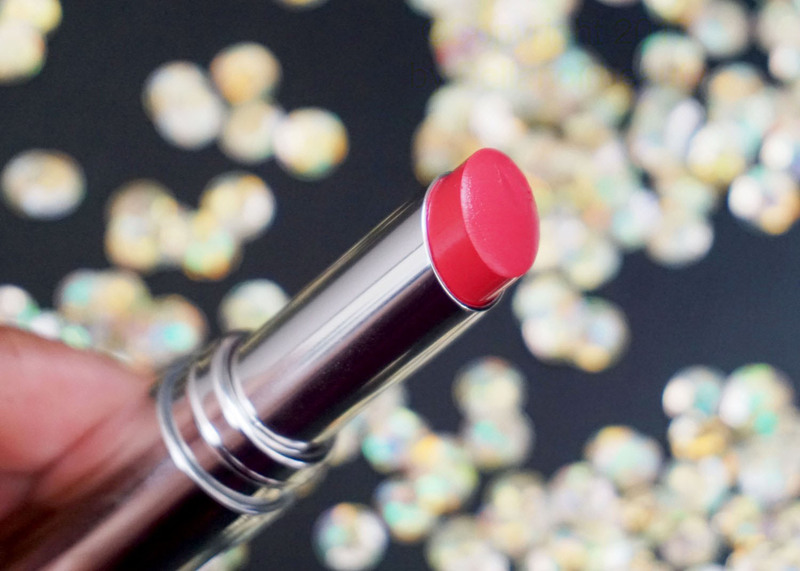 So those of you out there that want bigger lips, you will love this lipstick. These are transferable and behave like a long-lasting lip gloss, such as the True Whip Gloss Stains from Studio Gear Cosmetics. I did notice that after eating, Sulfurous was still going hard. I was really surprised that I didn't need to reapply and that most of the shininess had gone which resulted in a regular-looking lip color. These also leave a stain behind after wiping off, which I like! On a scale of 1-10, the Dior Addict Lacquer Sticks are a 7. I find myself often reaching for these, but they are pretty hard to dress down so I end up wiping them off and using something else. I am really picky about lip gloss and these remind me of lip gloss once I have them on.